I have always loved the investment of my Smaster player with Ableton on PC and MAC. Wait, so SM1 still coming? Sounds incredible; This is going to be among the elite class of iOS synths, perhaps better than even Syntronic due to it’s tweaking/patch making abilities. Thanks for the video Doug, Can’t wait to noodle away with this! Like the other guy said, I too hope they end up bringing desktop functionality via IAP.. I’d pay desktop prices for parity — I’m sure the A10 and up could handle it. But either way, I’m really looking forward to this. 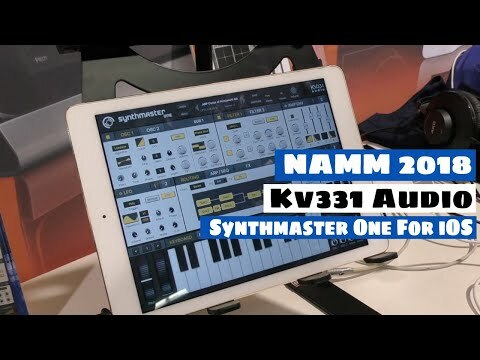 No rumors when we will see Synthmaster One on our beloved iPads? Cool! Waiting a lot for this! Just about a month away. Fingers crossed! Not sure how well the patches from the SynthMaster desktop versions work with the iOS SynthMaster Player. It’s supposed to work through iTunes transfer but that has yet to work for me (saving as iOS bank doesn’t show up as an option on the desktop and adding presets through iTunes made the iPhone app crash). Plus the iOS app hasn’t been updated since May. But NAMM 2018 should be a nice time to release something. Less than a month away! We have some neat wavetable synths on iOS, including PPG Infinite (released by Wolfgang Palm last Summer) and Nave (last updated by Waldorf in September 2015). KV331Audio still has some room to grow SynthMaster on our favourite devices. A seamless way to add custom patches from desktop versions would go a long way. So would an iOS editor. I will be periscoping synthmaster one running on an iPad tomorrow from NAMM. I saw it today. Looks great! I’ve been waiting almost one year for this moment! Benn a long time coming, I hope it will be worth it. Shame Sythmaster and NS2 were not released to coincide with NAMM would of given iOS music more of a shopfront to the general Music community. So far I say there been no earth shattering news coming out the place. Novation have no new gear reported midi controllers.etc or Arturia. Everything as usually is in the expensive bracket apart from the pocket operators. now, this synthmaster one is really interesting imho. hope we will have this thread filled with some stuff soon. the player thing was really cool, although I had some terrible problems with it in AUM, which they never fixed. So, for using it in a live setting is completely off the table. any speculations regarding the price? some NAMM promo for 20? any rumors? The transfer of SM DT patches/presets to ios SM player does work, but, it only works with the ones you create, not with the presets that are factory, or the ones that come with the plug in. A way around this, is to change a parameter slightly on the DT plug in, and save it under a new name, then, you will be able to transfer it to your ipad. I have done this with a good number of the presets on the DT. It's time consuming, but, I found it well worth the time to add such good sounds to my arsenal. Quoted from a synthmaster team dev on FB. Hey guys, we're very close to releasing SynthMaster One for iPad! It's gonna be identical to the desktop version except 2 things: Polyphony will be limited to 16 and engine quality will be limited to Good (2x oversampling). Initially we will support AudioBus and InterApp Audio, AUv3 support will follow later on. Drag and drop modulation is that a first for iOS ? Think Scythe Wavetable synth has drag and drop mod but great to see it implemented in a full blown iOS synth. It´s about time. I wonder since years why most iOS apps make it unfriendly to use modulations. I can deal with the polyphony limit. But stunting the audio engine will probably be a deal breaker for me tbh. I don't see what the point of this is other than as a commercially defensive move by the company to try and stop the port to ios affecting desktop sales? I think its a mistake in the times of Moog Model 15 etc to limit audio quality like this. Maybe but if you want to run several instances of an AU it might be better. Since it seems not so easy to add an option to choose the amount of oversampling like a few desktop tools does. I also think 2X will be good enough since you really just hear a difference with audio rate modulations or filter FM etc. And then you really need to hear it trough good headphones, speakers to hear that. Model 15 and Zeeon also „just“ use 4X oversampling (or correct me here if i‘m wrong) but still some tools sound better to me with no oversampling at all. And people still think they get everything for cheap......search for a new hobby. It just destroys good developers and lends to more iOS „toys“. 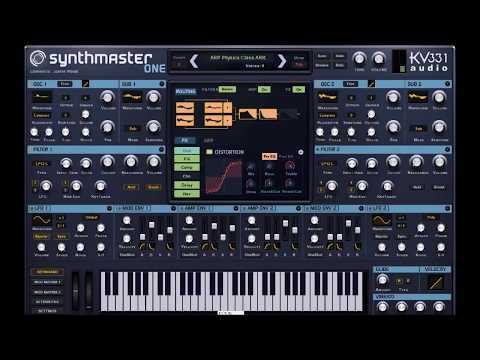 What is the sound resolution of Synthmaster player? I’s it 2x oversampling? They wait to the iPad Pro 2018 generation is released! I may pick it up once it is an AU. I don't think there will be an intro price low enough for me though to get a non-Au synth and then play the waiting game. Zeeon in BM3 is pretty much my min spec now for iOS synth usability and sound quality, anything less and I won't budge.